It’s been a busy summer! 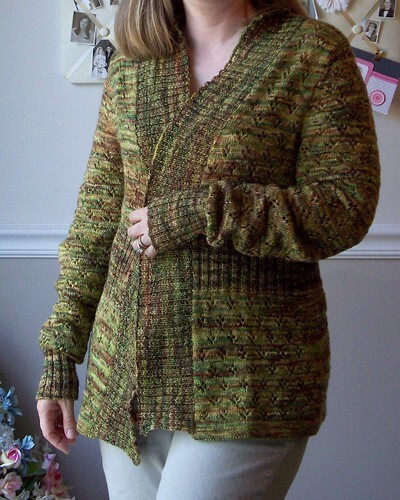 I have several finished objects to show you, but for this post I’m going to focus on the major one, my mom’s sweater! 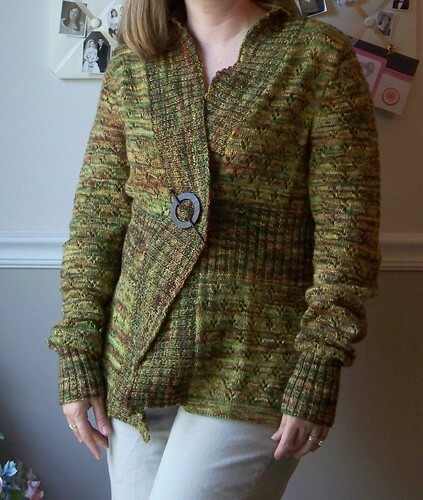 The yarn was bought at Stitches South – last year! Mom picked it out for me to make a sweater for her – and she had picked out a pattern at Stitches as well, but that pattern did not work out at all. (It was badly written, and badly designed.) So that attempt was frogged, and the yarn sat for a few months while I decided what would be best – and then I saw the Zora pattern – perfect! 1. I didn’t start the lace until after the turned hem – the pattern has you start the lace right after the turning row, but I didn’t like the look of that. That was it for modifications! It’s a very well written pattern, and it turned out beautifully. Next postWelcome to my new website/blog! Genius idea about where to start the lace. Give the bottom a strong foundation visually. Beautiful. You’re a very good daughter.